Obv: Seleucid anchor and Greek Legend: BASILEOS ALEXANDROU "King Alexander". Rev: Eight-spoke wheel or star within diadem. Hebrew legend inside the spokes: "Yehonatan the King". Alexander Jannaeus (also known as Alexander Jannai/Yannai) was king and high priest of Judea from (103 B.C.E. to 76 B.C.E.). His Hebrew name was Jonathan (Yehonatan). Although an effective military leader, he is seen in Jewish tradition as a ruthless tyrant who brutally persecuted the early Pharisees. The third son of John Hyrcanus, Jannaeus came to the throne after the death of his brother Aristobulus I with the help of Aristobulus' widow Salome Alexandra, whom Jannaeus soon married. Continuing the success of his father Hyrcanus, Jannaeus substantially expanded Judea's territory. However, his sympathy with the Sadducees deeply alienated him from the Pharisees and led to a bloody civil war, after which he executed hundreds of the Pharisees by crucifixion. After his death, Salome Alexandra, as reigning queen, reversed his policy toward the Pharisees, leading to what is considered in Jewish tradition to be a brief golden age of educational and religious reform. As King Yannai, Jannaeus appears as a wicked ruler in the Talmud, reflecting his conflict with the Pharisees. The other main source concerning his life is the first century CE Jewish historian Josephus, who, like the Talmudic writers, was sympathetic to the Pharisees. Jannaeus' reign is generally seen as the beginning of the decline of the Hasmonean dynasty. Jannaeus was the third sons of John Hyrcanus (175-104) B.C.E., one of the most skillful and effective of the Hasmonean ruler-priests. Hyrcanus, who did not assume the title of king but ruled with princely authority, succeeded Simon Maccabeus, who was assassinated in 135. Hyrcanus succeeded in substantially increasing the territory his forebears had wrested from the Greeks and also conquered lands formerly belonging to Samaria, destroying the famous Samaritan temple on Mount Gerizim. After his death, his son Aristobulus I succeeded him as high priest, and his wife was appointed regnant queen. Like his father, Aristobulus was a ruthless and effective warrior, who had helped Hyrcanus extend Israel's territory farther north than since the time of Solomon. Aristobulus, thus, desired the same unchecked power which his father had enjoyed and quickly ordered both his mother and his brothers imprisoned. Aristobulus openly styled himself both king and high priest, provoking the increased opposition of the emerging party of the Pharisees. The Pharisees insisted that the two offices must not be combined and also saw the Hasmoneans as unqualified to be kings since they were not of the Davidic lineage. They also objected to the Hasmoneans increasingly Hellenized style of living, which contrasted dramatically to the values of the early days of the Maccabean revolt. Aristobulus' reign last only about a year, as he contracted a serious illness and soon died. His wife, Salome Alexandra, then moved to liberate Alexander Jannaeus from prison, enabling him to become king. Soon after assuming the throne, Jannaeus took Salome Alexandra as his wife. Like his brother, he was an avid supporter of the aristocratic priestly faction known as the Sadducees. Alexandra, however, came from a Pharisaic family, and thus at the beginning of his reign, Jannaeus halted the suppression of the Pharisees. In the meantime, he devoted himself to military affairs. Jannaeus showed considerable competence as a military leader, repelling invaders and expanding the country's borders to the west and south. He was defeated by Ptolemy Lathyrus in Galilee, but then made an alliance with Ptolemy's estranged mother, Cleopatra III of Egypt, who helped him dive out Ptolemy's forces. After a setback against the Cypriot king Theodorus of Amathus in which Jannaeus lost some 10,000 men, he was able to move successfully against Philistia, capturing and burning the ancient city of Gaza in the year 96 B.C.E. 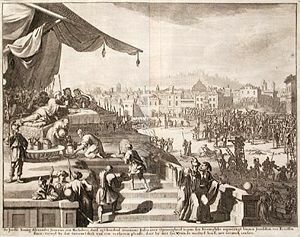 The policy of the Hasmoneans, inaugurated by John Hyrcanus, had tended to sacrifice Jewish religious issues for the sake of political interests, leading to increasing tensions with the Pharisees, who represented popular sentiment, while their opponents, the Sadducees, were made up of the nobility in support of the ruling dynasty. Although the coinage of Alexander Jannaeus followed Jewish tradition by avoiding human or animal representations, the inscription on his coins, Βασιλεὺς Αλέζανδρος (King Alexander), must have offended Pharisaic sensibilities. Moreover, Alexander's military campaigns from 104-98 B.C.E. had inflicted such hardships that his conquest of a few Philistine towns seem comparatively trivial. Although the Pharisaic leader Shimon ben Shetach was reportedly the queen's brother and a frequent visitor at the palace, relations between Jannaeus and the Pharisees were probably never very cordial. Still, while Jannaeus was still occupied with his military campaigns, the Pharisees were protected by the queen and may even have succeeded in instituting major educational and religious reforms. The execution of the Pharisees, showing Alexander Jannaeus feasting during the killings. Engraving by Willem Swidde, seventeenth century. After concluding his wars successfully, friction between Jannaeus and the Pharisees soon turned to violence. In his capacity of high priest, while offering the water libation on the Feast of Tabernacles, his manner of officiating offended the Pharisees to such a degree that the crowds pelted him with the citrons which they carried in accordance with one of the customs of this festival. They assailed him with loud cries and charged him and his ancestors with being ineligible for the priesthood. To make matters worse, Jannaeus used his foreign mercenaries to put down what he saw as a revolt, killing some 6,000 Pharisees and their supporters by some accounts. Later, returning from an unsuccessful expedition against Obedas, the king of the Arabs, he found his people, incited by the Pharisees, armed and arrayed against him. The ensuing civil war cost the lives of no less than 50,000 Jews. The Pharisees, meanwhile, unwisely allied with the Seleucid king Demetrius III against Jannaeus. Jannaeus first retreated, but then managed to prevail thanks to popular support against the Seleucid invasion of Judea. His most cruel act was the execution of 800 captured Pharisees by crucifixion in one day. This deed is rendered still more horrible by fact—if it is not a legend—that he caused the wives and children of the condemned to be slain before their eyes, while he, surrounded by feasting courtiers and courtesans, enjoyed the bloody spectacle. The remaining Pharisees now fled the country in fear, 8,000 of them emigrating to Syria and Egypt. Hated by the people, Alexander Jannaeus had now to rely mainly on hired foreign troops and thus he could not effectively counteract the increasing power of his nearest neighbor, the Arab king Aretas, who gained control of the road between Jaffa and Jerusalem. However, Jannaeus was able to ameliorate this disgrace between 85 and 82 B.C.E. by conquering the towns of Pella, Dium, Gerasa, Gaulana, Seleucia, and the fortress Gamala. At the siege of the fortified town Ragaba, he succumbed to a fever at the age of 51 in 78 B.C.E. His wife, Salome Alexandra, was present at his death. By his last will and testament, he entrusted her with the reins of government. The body of Alexander was brought to Jerusalem where, thanks to intercession of his wife with the Pharisees, it was interred with honor and respect. Salome Alexandra appointed their son Hyrcanus II High Priest, and Diogenes of Judea, the Greek military captain who advised Jannaeus to carry out the slaughter the Pharisees, was put to death. Alexandra, known in Jewish tradition as Shlomotzion (the peace of Zion) instituted a brief golden era in which the Pharisees became the leading political party and carried out widespread educational and religious reforms that laid the foundations for their future emergence as the leaders of rabbinical Judaism. Jannaeus may also have been the high priest named Jonathan who established the Masada fortress, rather than his great-uncle of the same name. Some scholars also connect him with a reference to a King Jonathan in the Dead Sea Scrolls, seeing this as evidence that the early Essenes may have been his allies against the Pharisees. Although Alexander Jannaeus had important military achievements, they proved to be of only a temporary character. He did not permanently enlarge the Jewish kingdom, but instead undermined its foundations. After his wife's death, his sons engaged in civil war in which the Romans were eventually also engaged, bringing an end to the Hasmonean dynasty and to Jewish independence. Bickerman, E. J. From Ezra to the Last of the Maccabees; Foundations of Post-Biblical Judaism. New York: Schocken Books, 1962. ISBN 9780805200362. Cohen, Shaye J. D. From the Maccabees to the Mishnah. Library of early Christianity, 7. Philadelphia: Westminster Press, 1987. ISBN 9780664219116. Sievers, Joseph. The Hasmoneans and Their Supporters: From Mattathias to the Death of John Hyrcanus I. Atlanta, GA: Scholars Press, 1990. ISBN 9781555404499. This article incorporates content from the 1901-1906 Jewish Encyclopedia and the 1911 edition of The New Century Book of Facts, both publications in the public domain. This page was last modified on 10 November 2016, at 20:02.